Never knowing when crisis or tragedy might happen we learn to be hypervigilant…always on our guard. Is today the day I get the call? Will it be a car accident? A school shooting? Suicide? Sometimes we feel as though we’re in a lethal game of chess with our kids, always trying to be two moves ahead and aware of the possible counter-moves. This type of hypervigilance can be exhausting. As a youth worker of At-risk kids, you may find yourself on a constant emotional rollercoaster with no scheduled stops. In times of crisis we often set aside our own needs entirely and as a result we risk burnout and compassion fatigue. Be reassured that the time for balance will come if you’re intentional, but there are some things you can do now. 1. 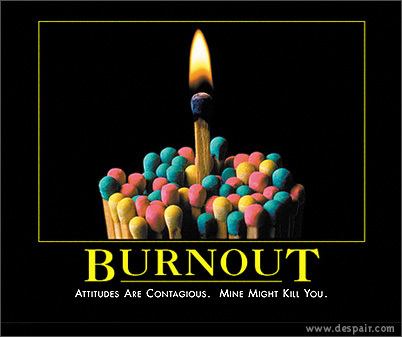 Seek supportive relationships – This will be essential in avoiding burnout. Build a network of friends, family, and peers who are kind and encouraging. Don’t isolate yourself in fear or shame. Seek respite in these relationships from the intensity of the situations your kids are facing. 2. Develop health-conscious behaviors– This is three-fold as I see it; rest, exercise, nutrition. Get adequate sleep, avoid snack foods, take a brisk walk daily. All three are important for emotional stability and combating low levels of energy. 3. Have fun – A life that is overrun with doom and gloom and that is absent of joy is not one worth having. We need recreation. It brings balance. Laughter releases endorphins which cause us to feel pleasure in our brain. Often, when working with At-risk kids we lose our ability to laugh. The best cure for a “lost laugh” is a “Three Stooges-I Love Lucy-Gilligan’s Island” marathon. 4. Spiritual retreat – It is essential that we create time for retreat. We should develop the discipline, schedule in our calendars, add to our budgets, the practice of seeking spiritual direction. There’s something magical and refreshing about pulling away from the insanity and seeking Abba’s face in solitude or with a spiritual companion. Jesus would often pull away after a busy day of ministry to connect with his Father. He would travel across the lake, go up the mountain, or into the garden to pray. This simple act breaks us of our dependency on ourselves. It causes us to reflect on whether or not we are growing a savior complex. Have I, with the best intentions, placed myself in the position of God? I have found that when my levels are the lowest it’s because I have been the one trying to “save” and “fix” kids myself. Being God is hard work and I’m just not cut out for it. If we expect to be in this for the long-haul we must pace ourselves. It is an intentional discipline that we need help in cultivating. I am thankful for the other youth workers God has placed in my life that help me find balance. They constantly remind me I am not God. And, we laugh a lot. As a result we have a better chance of loving and ministering to the kids in our community out of an overflow instead of a deficiency.